The Big Canoe Chapel Men’s Fellowship began a Home Repairs Ministry in 2007 to assist residents in nearby counties, including Big Canoe. The program is aimed at helping those who are unable to complete minor repairs to their homes, such as the elderly, widows and widowers, and people with special needs. Projects are not intended to replace work typically completed by licensed contractors. In October 2010 several of those participating in the program worked here at the Chapel to repair the wood rot under the front deck at the stairway. Future work to be scheduled involves the relighting of the whole deck and stairs in that section of the Chapel to the Tennis/Chapel parking lot. Past projects led to the replacement of a 35-year-old deck for a person in Big Canoe. It had rotted and become unstable. It required 160 man hours of labor to complete the task. Though this project was more extensive than the group would normally undertake, the need was there and it was very unsafe if left unattended. 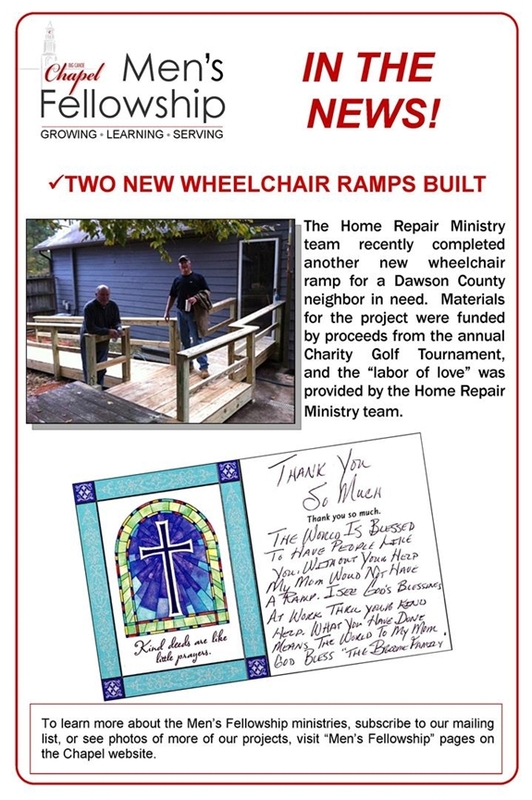 Other projects involved building an escape deck and ramp for a Foster Family in Jasper, a car port for a paraplegic and repair of a trailer, both projects are in Dawson County. Another project completed is a landscaped playground for a Foster Family in Dawsonville. If you would like to join this group or may be aware of someone needing assistance, please email [email protected] Prospective projects are evaluated on an individual basis.